Quinoa has made a comeback in recent years. Once a sacred “grain” of the Incas, quinoa was relatively unknown to American kitchens for decades. Pretty unfortunate considering the wide range of health benefits offered by this unique food, which is actually a relative of leafy green vegetables rather than a grain, and is one of the few plant-based foods providing a complete protein. 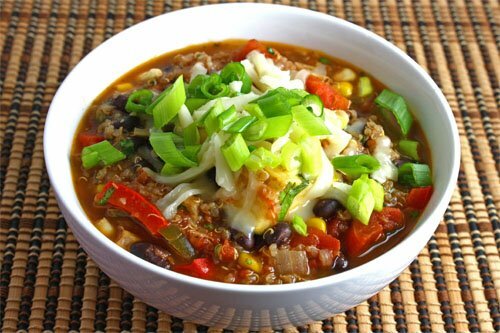 To learn more about why you should eat quinoa, I recommend visiting the world’s healthiest foods. Determined to serve the world’s healthiest foods to my family, I started to replace the usual whole wheat couscous or brown rice with quinoa every once in a while. I enjoyed the light, nutty flavor and interesting texture, but no one else seemed very excited about it (read: lots of leftovers). So, I set out to make the quinoa exceptionally tasty. Rather than my preferred method of improvisation, I deferred to the experts and went in search of the best recipes. My favorite source is a fellow blogger. Kevin at Closet Cooking. I love his blog so much that I browse the pages for inspiration before every trip to the grocery store. His recipes are healthy, often vegetarian, and delectable. His photos make my mouth water. And he has posted hundreds of recipes. Something for every mood. It’s only a matter of time before Kevin releases his first cook book. I’m only speculating, but hey, I’d buy it and I’d buy it for all my friends. 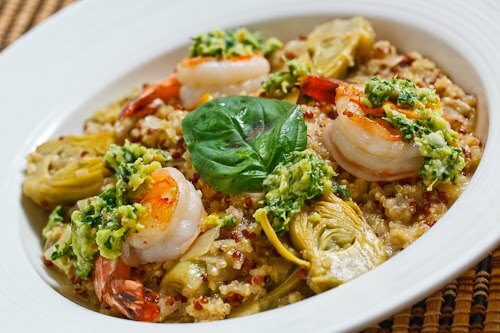 Thus far, I have created my own versions of Closet Cooking‘s Black Bean and Quinoa Chili and Baby Artichoke Heart Quinoa Risotto with Shrimp and Meyer Lemon Pesto. 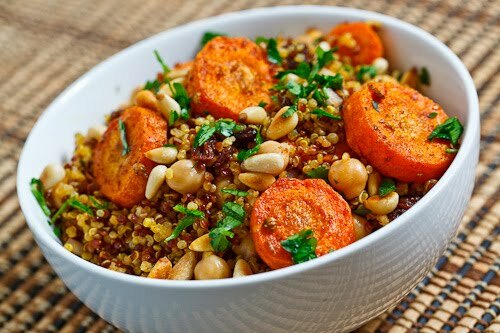 Moroccan Roasted Carrot and Chickpea Quinoa Salad is next in the cue. If these sound good to you, wait until you see the pictures posted below. This weekend I made a Black Bean, Roasted Corn & Avocado Salad on a Bed of Red Quinoa. Not a Closet Cooking recipe, but delicious nevertheless. This recipe actually came from the back of a box, Trader Joe’s Organic Red Quinoa. It involves Trader Joe’s Cilantro Dressing, which my mother has loved for years, so I was sold. And TJ sure didn’t disappoint. This dish was colorful, boasting deep reds, bright reds, greens, and yellows. Apparently, it appeared too healthy to be yummy to a certain three year old’s discerning eye. Emile hadn’t even taken a bite when he started complaining about not wanting dinner. Next thing I knew, his plate was cleared. Success.